Obviously I didn't finish my Ashton shawlette before the end of the Olympic closing ceremonies, or I would have been bragging it up. Well, life (meaning family and work) got in the way, and I semi-seriously overestimated my knitting abilities. No medal for me. I was able to make continual progress on it though, and I finished it up a few weekends ago. I had to buy another skein because I ran out of yarn with 7 pattern rows left in chart 4. 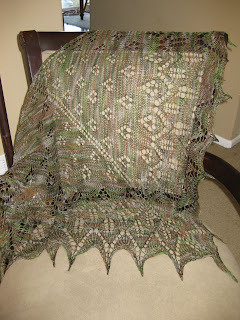 I worked on it at Spinners With Altitude knit group (lovin’ these ladies!) and finally finished it up. I've been waiting to wash and block it until I can borrow some blocking wires (oh, the tools and gadgets used by knitters would boggle your mind), but I'm like a kid at Christmas and just can't wait any longer. So I soaked it in the sink and used pins and scrap yarn to block it out until it's dry. The pattern instructions were awesome, and I felt comfortable knitting the entire time. Maybe lace isn't so intimidating after all! If I would have had entire days free and hours each evening, I might have been able to finish in time, so I wasn't necessarily completely off in choosing this project for the Ravellenic Games. It wasn't the difficultly level of the knitting, or beyond my skills, it was just knitting speed and lack of free time. I should have realized I wouldn't have had that much time, and chosen a smaller project. Oh well, better luck in 2 years. Yes, this is a queen size bed my "shawlette" is pinned out on. And that's a Mass Transit from Bristol Brewing Co. on the bedside. I needed it after seeing how big this thing turned out. Blocked it, and discovered my shawlette is definitely a shawl. No wonder I needed more yarn! The finished size ended up being 76”x38” vs the 52”x26” called for in pattern. Oops. Silly gauge! However, I am loving it. Could definitely see myself repeating this pattern for a gift also, after making sure I was using correct needle/yarn to get the correct size. Can't wait for the winter Olympics now!